Fall is right around the corner, and even though it doesn’t feel like anything but summer in California, I am so ready for the change of the seasons. Normally, right now I would be drinking cup after cup of Anniversary blend, but we won’t have that treasure until after Christmas. Instead I grabbed one of my other fall favorites, which is not sold in Starbucks stores. You can find Fall blend at Target, Wal-Mart or Amazon. Fall blend is a blend of coffee from all three growing regions, and is a hearty blend with warm spice notes. Fall blend combines coffee from Sumatra, Kenya and Peru. Each region bringing a different nuance to the cup. The warm spice of Sumatra, the crispness of Kenya and the nuttiness of Peru. This is a very versatile cup that can go with many different pairings. For this pairing, I really wanted to bring out the warm spice notes. When I was at Trader Joe’s a few days ago, they were just putting out all of their fall stuff. I saw the ghosted maple syrup (maple syrup with ghost peppers!!!!) and instantly knew I wanted to use this to make marshmallows and pair them with this coffee. Many people ask where I get these ideas, and I don’t have an answer. I will randomly see something and have an “a-ha” moment. 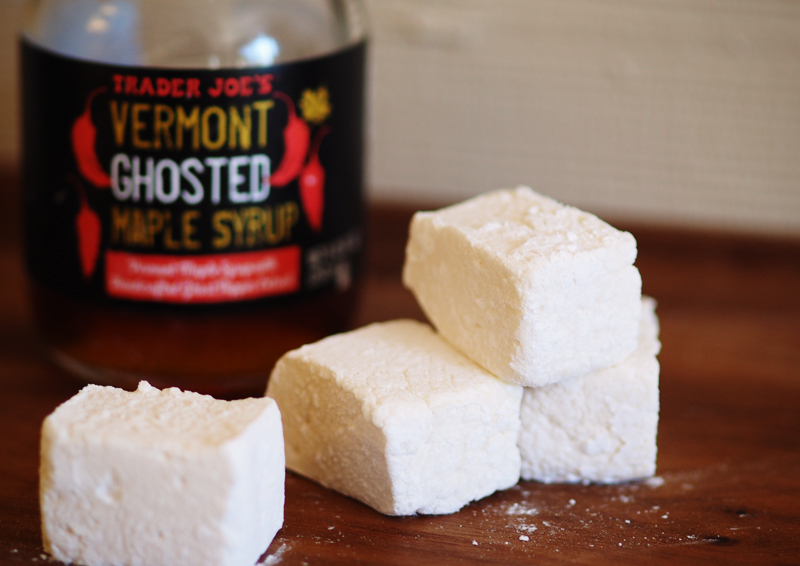 The ghosted maple syrup was my a-ha moment for fall blend! Place the gelatin into the bowl of a stand mixer along with ½ cup of the water. Have the whisk attachment standing by. In a small saucepan combine the remaining ½ cup water, granulated sugar, maple syrup, corn syrup, and salt. Place over medium high heat, cover and allow to cook for 3 to 4 minutes. Uncover, clip a candy thermometer onto the side of the pan and continue to cook until the mixture reaches 240 degrees F, approximately 7 to 8 minutes. Once the mixture reaches this temperature, immediately remove from the heat. Turn the mixer on low speed and, while running, slowly pour the sugar syrup down the side of the bowl into the gelatin mixture. Once you have added all of the syrup, increase the speed to high. Continue to whip until the mixture becomes very thick and is lukewarm, approximately 12 to 15 minutes. Add the vanilla extract during the last minute of whipping. While the mixture is whipping prepare the pans as follows. 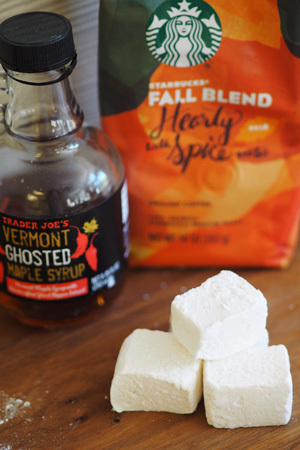 When making marshmallows, make your life easier and invest in a marshmallow pan. I am not one for kitchen unitaskers, however, this is one I can not live without! I saw the picture of your marshmallows on the TJ’s Facebook page, and was really intrigued! Thank you so much for posting this recipe! They sound, if you’ll pardon my French, effing awesome! I’ve added the ghost pepper syrup to my TJ’s list, but noted that you’ve bought similar on Amazon, should my store run out early. Can’t wait to try these! Once again, thanks…awesome idea! P.S. Haven’t made these yet..but I’m rating them anyway! They HAVE to be fantastic!